Do these facts indicate the fragility of the American shale boom, don’t they? If so, what does that mean for Europe? The technology of hydraulic fracturing has been known for many decades. The first experimental hydraulic fracturing treatment took place in the United States in 1947 on the Hugoton gas field in Kansas. However, at the time due to low gas prices this technology was considered too expensive for shale deposits. The situation changed in the 2000s, when gas prices grew significantly arousing interest among mining companies to start fracking of shale formations. It is important to recall that new technologies for drilling long horizontal wells hit the market at the same time. All of these stimulated a rapid development of shale resources in the US and a steep rise in production of shale gas. Exploration and production of oil and gas from shale are conducted currently in many regions of the US. ● the Barnett Shale play extends over Northern Texas. The Marcellus Shale gas play is the largest shale formation in the US occupying a total area of about 95 thousand sq. miles. By early 2015, the Marcellus Shale was yielding about 40.8 mcm of gas per day. At that time, the Marcellus was the source for over 36% of the shale gas produced in the US. According to expert estimates, it is more than enough to supply gas to a half of gas-fired power stations in the US. The average thickness of the productive layer ranges from 15 to 60 m. and the depth ranges from 1.2 to 2.6 km. Technically recoverable gas resources amount to 7.4 tcm. Over 8,000 wells were drilled for gas extraction from the Marcellus Shale play and about one hundred new wells are added each month. According to extraction technology after a vertical drilling to a depth of around two-kilometer each well turns for another kilometer inside the shale formation into a horizontal direction. There are more than 30,000 wells drilled at above-mentioned four major shale plays, which in total produce two-thirds of shale gas in the US. The volume of shale gas production in the US reached the highest level of about 275 bcm in 2012. The forecasts of the Energy Information Administration in its Annual Energy Outlook 2014 were based on the expectation that natural gas prices would gradually rise, but remain relatively low, predicted US gas production growing until 2040, driven by large increases in shale gas. It is shown in the graph below. However, actually expert opinions about the prospects of shale gas production in the US differ dramatically. Official EIA forecasts are criticized that they insufficiently take into consideration the factors capable of undermining the predicted upward trend. 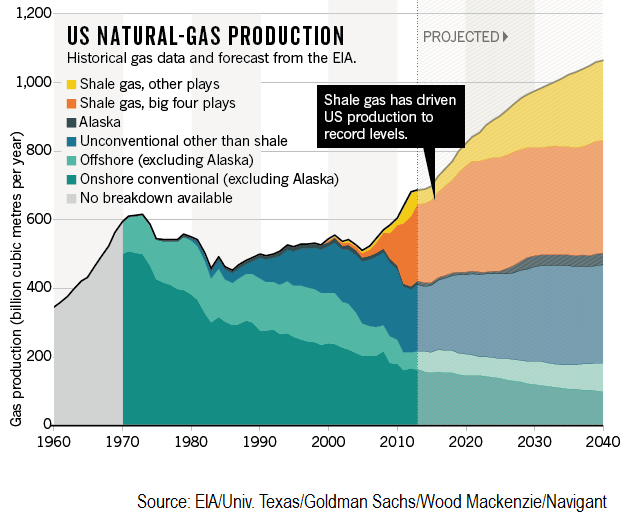 Alternative forecasts of future development of shale gas in the U S developed by a team of geoscientists, petroleum engineers and economists at the University of Texas at Austin had a wide recognition. These forecasts resulted from three-year studies of the major shale plays in the US. The research appeared in some academic journals such as "Proceedings of the National Academy of Sciences". The Texas team predicted that production from the major four plays would peak in 2020 followed by downturn. 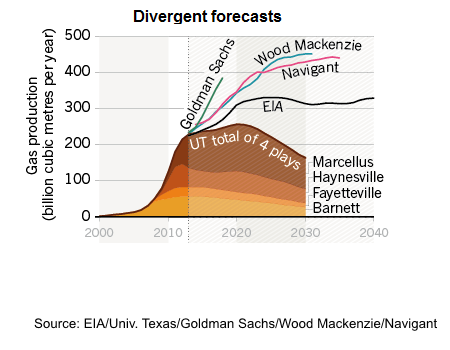 As shown in the graph below, in 2030 these plays would be producing only about half as much as in the EIA forecast. Experts indicate much more detailed analysis conducted by the University of Texas. The EIA research breaks up each shale play by county, calculating an average well productivity for that area. But counties often cover more than one thousand sq. km, large enough to hold thousands of horizontal fracked wells. Compared with that of the Texas team splits each play into blocks of one square mile (2.6 sq. km) that is at least 20 times finer than the EIA's. Experts have noted that the level of detail is of great importance, since the distribution of shale gas over the deposit area is not homogeneous, and accordingly, the performance of the wells may vary significantly. Researchers from the University of Texas found that the major shale plays included into the studies do not have so many spots with really high production potential, which will be sufficiently profitable. Moreover, as it turned out, shale formations are rather rapidly exhausted. Therefore, the life of shale wells usually does not exceed a maximum of 3-4 years. Under conditions where wells are losing their performance rapidly, companies need to step up drilling activities to support further growth in shale gas production. In comparison the US companies drilled in total 12,000 wells in 2005, but in 2013 the same number of wells were drilled already over a period of less than one month. It is important that such a dramatic increase in drilling operations leads to the growth of capital and operating costs of shale plays development, which appear significantly higher than with conventional gas production. As a result, shale gas cannot compete on equal terms with the natural gas produced by traditional technologies. It is obvious that due to objective reasons the opportunities for increasing the number of wells are not unlimited. The results are “bad news”, said Tad Patzek, head of the University of Texas at Austin's department of petroleum and geosystems engineering, and a member of the team that was conducting the studies. With companies trying to extract shale gas as fast as possible and export significant quantities, he argues, “we're setting ourselves up for a major fiasco”. The United States is still seeking to promote shale gas exploration and development to Europe. However, such diverging opinions regarding the future of the US shale industry now more and more curb the EU enthusiasm for developing these alternative energy technologies. Recently the new regulation has been adopted by the German government that fracking should be prohibited in so-called sensitive regions such as nature parks or water bore areas, and in depths above 3,000 meters. The measure still needs to be passed by the Bundestag when it goes up for a vote in May. With all of these going on, why not take the plunge in all countries of the EU and completely bury a utopian idea of shale gas production in Europe? Your approach to this article is really useful for natural gas report.